In the past when I’ve had to protect my camera from the rain I’ve resorted to using Ziploc bags, grocery bags, and even cheap disposable camera bags that were really little more than glorified grocery sacks. That was all well and good for a Rebel XTi, but when I have an investment in a camera like 5D Mark II that doesn’t have weatherproofing or a 1D Mark IV that is going to be in a heavy downpour for an event, I want more protection. 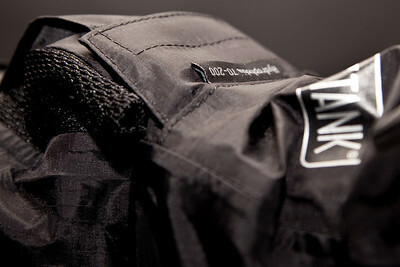 This is where ThinkTankPhoto’s Camera Rain Covers like new Hydrophobia 70-200 comes in. It’s designed to accommodate Canon & Nikon’s most popular lens – the 70-200mm, and in my case even worked fine with my 100-400mm as there’s a little extra room in it. 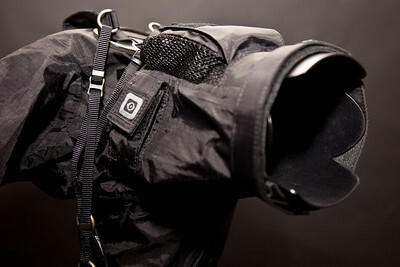 As you can see in the pictures above and below, this product really covers your gear quite well. In fact, you can remove your eyepiece and replace it with one from ThinkTankPhoto to have a snug fit around the eyepiece area to avoid having water leak in around this vulnerable spot. I used the EP-C for my 5D Mark II and the EP-CIII for my former 1D Mark III body and my current 1D Mark IV body. 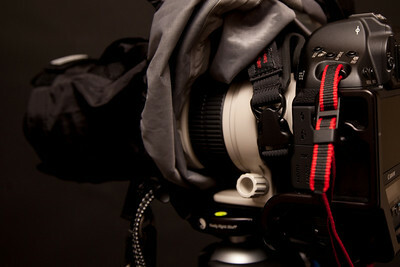 There are also EP-N series for Nikons and some even work for Sony DSLR’s. The handy sleeve allows you to get one hand in there and work your camera like you are used to, and your other hand can operate external to the bag which I found to be acceptable – but sometimes you have to push a little harder. There’s a even handy flap to cover your eyepiece while you are waiting for the action to resume. There’s a lot more to this camera rain cover than you might imagine. A lot of thought and great design by industry pro sports shooters have made the perfect bag that features a place to store your memory cards, a nice rain lens cap, and the ability to tuck your camera strap away nice and neat while using the built-in one in the rain. The straps will even hook on to your Camera Support Straps which will fit nicely on most TTP backpacks. 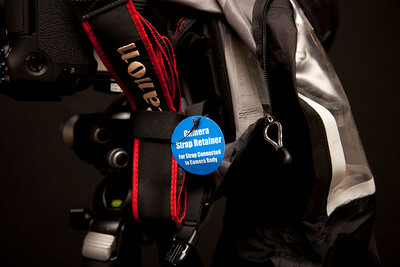 I use mine so camera stays put without swinging back and forth and is secure if I have to run. 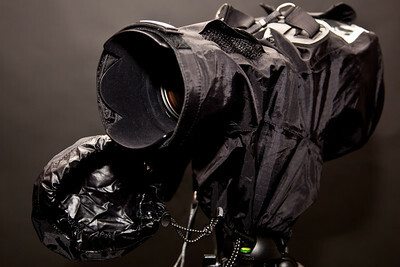 This is an expensive product for protecting your gear in the rain, but it’s much cheaper than repairing damaged gear. 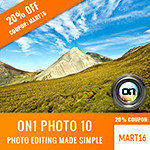 For the pro or prosumer shooter specializing in outdoor photography where the weather turns bad, this is a must own product. It will allow you to concentrate on your shoot and not worry about your camera getting damaged. 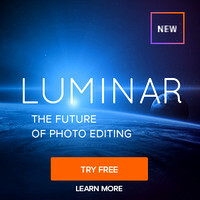 For the casual or beginner this is a pure luxury that you should only consider when you’ve completed your camera body, lens and support items. I had intended on showing you this product in action in Vancouver at the Olympics, but sadly I didn’t see a flake of snow or a drop of rain while I was there (isn’t that how it always works?). Even my hometown of Seattle has been crazy dry for this time of year, so even an impromptu rain demo hasn’t aligned with my schedule. As a result, this video is merely an interactive walkthrough. I have poured water on the bag with a water hose and everything came out fine – of course using a hose creates an unnatural angle so I got a little water on the end of my lens, but that’s all good. With the eyepiece cover and lens cap cover in place, it stayed totally dry on my tripod. I don’t think this product would help those doing river rafting where the camera could be submerged, so I still recommend a underwater camera housing. However, if you are making a trip under Niagara Falls on the Maid of the Mist (or whatever that boat is called) you’ll be glad you had this covering your camera. Highly recommended for those who can afford it, but not for those tight on cash with other items still on the wish list. Canon shooters – I can confirm that this works very well with the new Canon 70-200mm f/2.8L IS II USM lens on a 1D Mark IV to protect your $7500 sports setup! 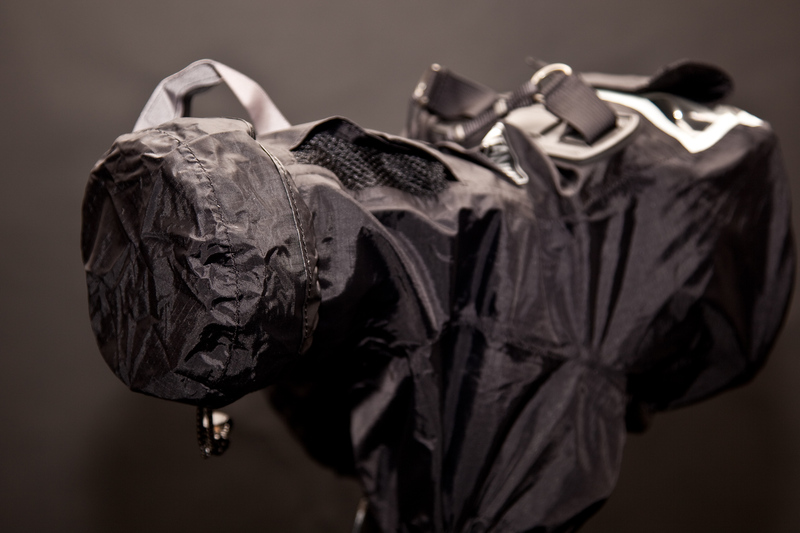 I’d also like to point out that this is an award winning product – see Hydrophobia® 70-200 Rain Cover Named Winner 2010 DIMA Award. how does your left hand get inside to work the lens (zoom in/out)? It doesn't need to. You just rotate through the bag. It works fine for me, but now that you mention it - it could be an issue if you wanted to chagne image stabilization modes. thats not a CF card pouch! 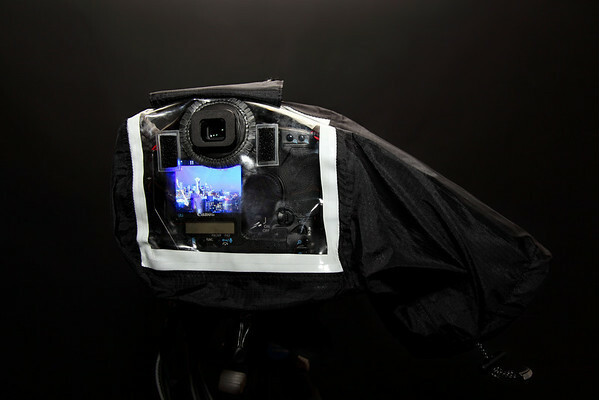 How would a CF card stay dry in there!! 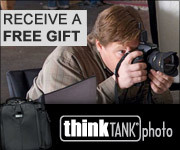 Its a place to put your eye piece from your camera when you are using the Think Tank eyepiece! Anonymous - You are correct in saying that the pouch that I refer to is designed for the eye piece adapter. 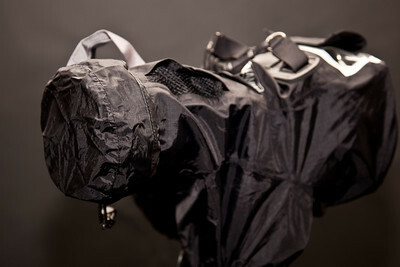 To answer your question about how would a CF card stay dry in there, the answer is - it depends on how hard is is raining. Here in the Northwest, it rarely rains hard enough to even come close getting to that compartment, but back in New Orleans where I grew up it would get wet for sure. With that said, go check out my review about CF cards from SanDisk in February 2010 while I was at the Olympics. The SanDisk Extreme CF cards contain a silicone liner in them to protect them against the elements, so the reality is that you could use it as a CF card holder, but you can also use your pants pocket too, so I'll concede that I made a mistake in my discussion of the purpose of that particular pouch. 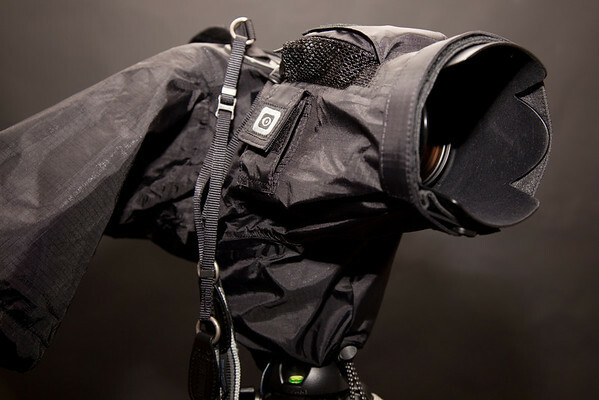 I was wondering if you can tighten the lenstrap so the camera will stay secure when u use the strap of the Think Tank hydrophobia. I want to use it on the 70-300 nikon, Tokina 11-16, Sigma 150mm Macro and the 16-85 nikon. Will the camera fall if it cant be tightened further? I'm no expert, but you can see how I did it on the video. There support is friendly and outstanding, so I wouldn't risk damaging your equipment. Please double-check with them! I've just got my Hydrophobia today. After a small discovery process for an hour :) I'd thanked myself for giving the right decission... I already got one KATA E-702 but it cannot be compared with tihs one..